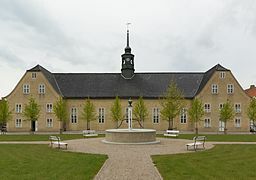 Founded in 1773 in South Jutland, the site is an example of a planned settlement of the Moravian Church, a Lutheran free congregation centred in Herrnhut, Saxony. The town was planned to represent the Protestant urban ideal, constructed around a central Church square. The architecture is homogenous and unadorned, with one and two-storey buildings in yellow brick with red tile roofs. The democratic organization of the Moravian Church, with its pioneering egalitarian philosophy, is expressed in its humanistic town planning. The settlement's plan opens onto agricultural land and includes important buildings for the common welfare such as large communal houses for the congregation's widows and unmarried men and women. The buildings are still in use and many are still owned by the local Moravian Church community . This article uses material from UNESCO World Heritage List article "Christiansfeld", which is released under the Creative Commons Attribution-Share-Alike 3.0 IGO License.